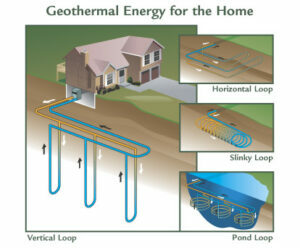 Geothermal heat or, “Green Heat” is the environmentally friendly and cost-effective way to heat your home or business. Our Environmental Services Division specializes in the “groundwork” needed for your geothermal installation. Geothermal technology uses the earth’s renewable energy, just below the surface, to heat or cool a home or other building, and to help provide hot water. It’s sometimes referred to as a geothermal heat pump, a ground source heat pump, geoexchange, earth-coupled heat or green heat. No matter what you call it, geothermal systems are the best choice you can make for both your pocketbook and your planet. A few feet beneath the surface, the earth’s temperature remains fairly constant, ranging from 45º or so in northern latitudes to about 70ºF in the deep south-year round. Geothermal takes advantage of this constant temperature to provide extremely efficient heating and cooling. In winter, water or a water solution circulating through pipes buried in the ground absorbs heat from the earth and carries it into the home. The geothermal system inside the home uses a heat pump to concentrate the earth’s thermal energy and then to transfer it to air circulated through standard ductwork to fill the interior space with warmth. In the summer, the process is reversed: heat is extracted from the air in the house and transferred through the heat pump to the ground loop piping. The water solution in the ground loop then carries the excess heat back to the earth. The only external energy needed for geothermal is the small amount of electricity needed to operate the ground loop pump and fan. Not necessarily. It depends on how you measure cost. While they sometimes cost more to install in homes than conventional systems because of the ground loop piping, geothermal systems typically have the lowest life-cycle cost of any heating and cooling system. Heating and cooling costs for a typical 2,000-sq.-ft. home can run as low as $1 a day. Moreover, installation costs have declined substantially in recent years, as more builders and contractors offer geothermal systems, and as the industry develops innovative ways to install the systems faster and more efficiently. Altogether, geothermal systems are a sound investment. The amount they save the homeowner every month in energy costs is more than enough to offset their higher installation cost.